The White House urged allies on Monday to do more in the campaign against the Islamic State, while President Barack Obama faced pressure in return to show the U.S.-led coalition will intensify efforts in response to the Paris attacks, even without a major shift in strategy. Requests for more counterintelligence, military and humanitarian assistance came a day before French President Francois Hollande was to arrive at the White House to discuss the fight against the extremists believed to be behind the Nov. 13 attacks that killed 130 people. Hollande, who next visits Russian President Vladimir Putin, is expected to seek more coordinated military operations that would include both the U.S. and Moscow. At the White House, spokesman Josh Earnest said the U.S. may step up efforts supporting strategies believed to be working — airstrikes and train-and-assist missions in Syria and Iraq — but he played down the possibility of any surge of new American resources into the fight. Vice President Joe Biden sought those resources from allies at a meeting with ambassadors from 59 of the 65 countries in the coalition. The discussion focused on what more the countries could do to cut off financing for the Islamic State’s global network and how to stem the flow of fighters crossing into Syria and Iraq to join the group, the State Department said. Separately, the U.S. military said it had destroyed 283 tanker trucks used by IS militants to transport oil from producing fields in eastern Syria to smuggling points, an acceleration of attacks aimed at crippling the group’s oil revenues. The attack by four A-10 attack planes and two AC-130 gunships was carried out Saturday at a site near Deir el-Zour and al-Hasakah but not made public until Monday. After meeting with Obama, Hollande is headed to Moscow to meet with Putin, who has also expressed his intention to ramp up a campaign against the Islamic State. The White House has not ruled out greater cooperation with Russia, but has expressed skepticism that Putin will focus the fight on the common enemy rather than use its airstrikes to undermine the moderate forces fighting Syrian President Bashar Assad. Earnest said Monday the U.S. would “continue the conversation” with Putin but suggested Obama would make no promises to Hollande during Tuesday’s visit. Rather, the meeting would be focused on the U.S. showing support, he said. 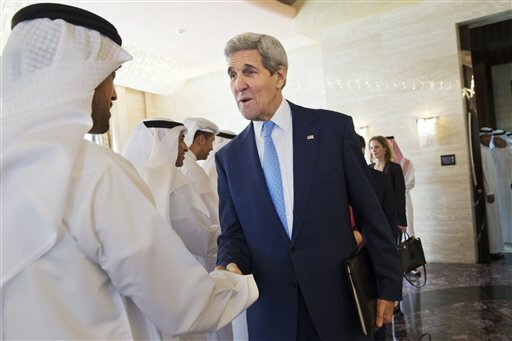 Kerry, meanwhile, suggested the U.S. was exploring some new ideas. Between meetings with Arab officials in Abu Dhabi, the chief American diplomat told reporters Obama was asking everyone in the U.S. government for new concepts to speed up the fight. Some steps were in motion before the Paris attack, he said, such as a decision to deploy a small number of U.S. special forces to Syria and the continuing efforts toward a cease-fire between Syria’s government and rebel groups. “The key is to destroy Daesh rapidly in Syria and in Iraq,” Kerry said, using an alternative term for the Islamic State. But neither Kerry, nor the White House, outlined any specific post-Paris additions to the strategy. Criticism of the U.S. strategy to this point has begun to grow louder. On Sunday, both Sen. Dianne Feinstein, a Democrat from California, and former Obama Defense Secretary Leon Panetta said the U.S. effort wasn’t measuring up. Feinstein called for more aggressive action and addition special operations forces in Syria. Associated Press Writer Bradley Klapper contributed from Abu Dhabi and National Security Writer Robert Burns from Washington.